Looking for more Peaceful, Positive, Productive Home or Office? Do you you not feel peaceful in your home? Is tension and anxiety ruining what used to be your sacred space? Do you sense a presence...but no one is there? Perhaps you hear noises, doors opening/closing, feel temperature changes or that you're not alone. Maybe electronic devices are suddenly operating on their own or not at all...you've noticed objects disappear and then reappear in different places or you 'see' something that isn't really 'there'. Do you have a house or business that just won’t sell or do you have a business that is struggling despite your best efforts? If you've answered "yes" to ANY of these questions, you are ready to have your home or office Cleared! 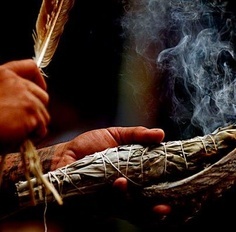 Smudging is a general term that describes the ancient use of burning sage, incense or other natural materials to clear energy. In MANY different parts of the world, in many different religions and spiritual practices, the use of burning 'matter' is used to bring positive energy. In scientific terms...the smoke (or water mists) changes positive ions to negative...which physically makes a space feel more comfortable...welcoming! I use the term "Smudging" to describe the act of Energetically CLEARING your space. While many try to do this on their own by using burning sage to eliminate energy, a trained Practitioner, such as myself, works on MANY levels to assure that your space is cleared, blessed, protected and ready to welcome your BEST energy and intentions! I will visit your home with my "arsenal" of clearing tools...from specially blessed Sprays, to infused salts, specially prepared sage as well as Reiki and Prayers to ensure that you are "covered"...from outside your home to every room inside...top to bottom! As I move through your space, I will use my skills as an Empath and Medium to let you know what energy I sense is present and use the appropriate 'tools' to remove this energy! All negative or inappropriate energy is gently escorted out...and loving, supportive and protective energy is asked to stay and assist in protecting your home. After the array of prayers, rituals, smudging and clearing, I leave each space with a container of special salt to ensure continued clearing, a candle to bring in positive energy and incense to welcome more positive energy. PLEASE NOTE THAT I my current schedule permits my availability ONLY to visit homes and businesses in the vicinity of Clifton, NJ and by appointment ONLY. If you are a 15-20 minutes from Clifton, feel free to inquire. The cost to clear an average-sized home (approximate space of 1500-2000 square feet) is $225 (cash payment. $235 for credit card and PayPal Payments). If you are interested in discussing your situation or booking me to visit your Space, please feel free to email me today! Disclaimer: All Gia's services and the use of this website are intended for use by adults 18 years of age or older. By using this website, you confirm that you are at least 18 years old. All services are for guidance only. All decisions and actions made after our contact is your personal responsibility and choice. All readings and all questions answered should at no time be regarded as legal, medical, financial, psychological or business fact and are subject to your own interpretation and judgement. For legal reasons be advised that all readings should be considered for entertainment purposes only. Booking and paying for an appointment confirms that you understand and agree to these terms. *Gia has the right to refuse service at her sole discretion.